This is a discussion on 130k Christmas freeroll within the online poker forums, in the Poker Rooms section; How can i get ticket for it?? How can i get ticket for it?? And where i can see how many i did?? you're talking about a single freeroll , or when you qualify via challenges ? Wow 130k guaranteed freeroll. Probably Stars only. You Need a "Santa's Freeroll Ticket" to play. I believe you have to complete 10+ Christmas Challenges to get ticket not 100% sure though. I contact Pokerstars support, this challenge need complete..
Hahaha classic ps scam... They probably said that only to their friends... Where normal player who didn't contact them could find that?? I through with you, they say that I complete only 2 challenges, and I was register on all 10 shootout, thats mean that I complete challenge If I was register I think. This is funny, after your reply i sent them mail that i am sure i made 10 chalenges (i didn't if those don't count), and got reply: Congrats you did do it, we credited your acc with santa's ticket... Realy???? So basicly they gifted me a ticket.. Unfortunately, I didn't complete only 3 challenges. What did you write the support to get it? To receive such a ticket, it was necessary to do 10 tasks from the beginning of December and then pokerstars gives a ticket to this tournament! I'm out of this tournament, I did not qualify, in the challenges. It is for players who finish min. 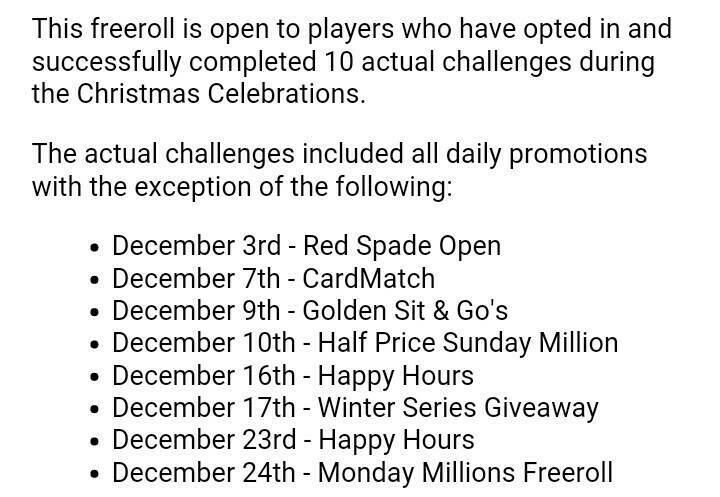 10 poker challenges this month. So Pokerstars did not promote this freeroll from the start of there Christmas Promotions? ?Surprise from greedy Amaya corporation. Well, how can this be called? Have you given the ticket after the tournament is over ?! horror.